You don’t need to be an economic wizard or finance guru to know the definition of GDP. Even if you never took the ECON 101 class or have absolutely no inclination the financial side of the things here is the definition — GDP stands for Gross Domestic Product & it is the traditional measure used to measure financial well-being of a country and its citizens. It is the sum of the output, income and expenditure in an economy on which fiscal & monetary policies are eventually based. An increase in GDP is considered as a healthy sign & the governments’ policies are devised to increase the efficiency of produced goods in the country which eventually accounts for an increase in the size of the economy. But there are a couple of problems with measuring economic growth this way to which I will come to a little later. First, GDP is a measure of income not wealth since it calculates values of a country’s goods & services rather than taking stock of natural, physical and human assets. If the eventual purpose of economic development via GDP is the well-being of the general population than it is a poor measure of human progress. Secondly, quantifying economic progress to GDP is faulty since it fails to account for what a country loses in achieving a higher GDP. In the current scheme of things, economic progress & production efficiencies have increased systemic risks to the global ecosystem. Short term economic gains have been traded off with long-term problems like Air & water pollution, Climate change risks & depletion of natural resources at an alarming rate. And with a burgeoning global population, this model of economic development is unsustainable in the long run. 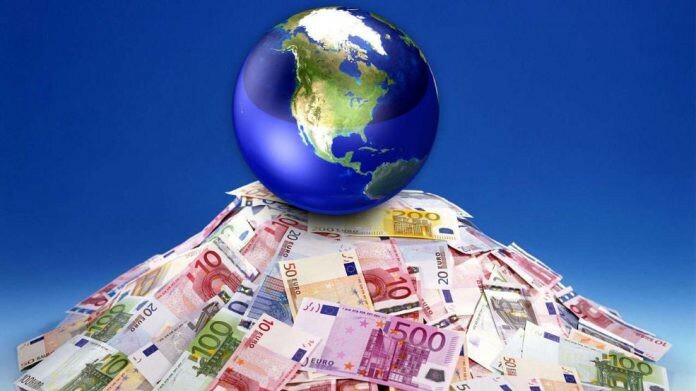 Work has been in progress for quite some time now to use a new index to measure the economic growth of a sustainable global economy going forward and the time has come to pay attention to the findings the report that suggest the new index. Looking at the chart (above) at the factors of economic development — despite the more obvious GDP per capita growth over a period of 22 years from 1992–2014, the natural capital has been on a consistent decline which is contrary to the new sustainable goals of economic development set forth by the UN. Dubbed the Inclusive Wealth Index (IWI), it was theoretically presented in the Inclusive Wealth Report 2012: Measuring Progress Toward Sustainability — a joint research effort by the two UN bodies, United Nations University (UNU) & United Nations Environment Program (UNEP). The IWI has been devised to replace Gross Domestic Product (GDP) and the Human Development Index (HDI) to measure economic progress. It is a much more accurate measure of economic progress since it accounts for all five capital factors (financial, manufactured, human, social & natural). Many countries are recording GDP growth at the expense of losing natural capital. 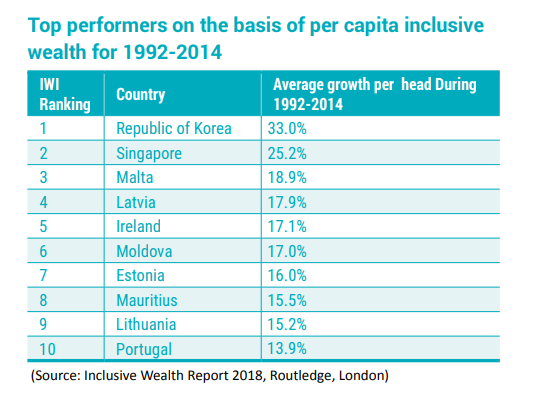 As you can see in the figure above the best performing countries based on the inclusive wealth matrix are not the big developed countries. Good news is that we are beginning to move in the direction of sustainable development — Canada’s Comprehensive Wealth project 2018 is one such step in the right direction. The main objective of this project is to encourage the Canadians & their government to move “beyond GDP” as a fundamental measure of economic development and measure “comprehensive wealth” by including all the factors of Inclusive Wealth Index. The report also raises a red flag by pointing out that annualized GDP grew @ 1.31% in Canada but comprehensive wealth only grew by 0.2% in the period between 1980–2015. Much work still needs to be done to bring these five factors of economic prosperity into a single framework so that a unified approach towards a sustainable global economic policy can be devised not just for the current population but for generations to come. Originally published at www.datadriveninvestor.com on March 8, 2019.